Expo 2020 Dubai and its legacy are expected to contribute Dh122.6 billion ($33.38 billion) of gross value addition (GVA) to the UAE’s economy from 2013 to 31, according to an EY report. 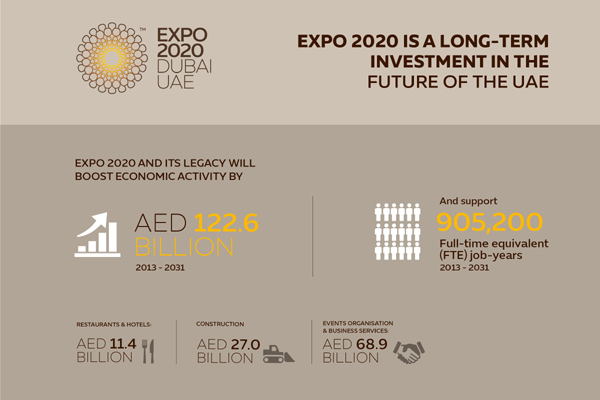 The report, ‘The economic impact of Expo 2020 Dubai’, states that Expo 2020 is also expected to support up to 905,200 full-time equivalent (FTE) job-years in the UAE from 2013 to 31, which is equal to approximately 49,700 FTE jobs per annum in the UAE over this period. In addition, small and medium-sized enterprises (SMEs) are estimated to receive Dh4.7 billion in investment during the pre-Expo phase, supporting approximately 12,600 job-years, while also supporting Expo 2020’s aim to foster innovation and support small businesses. Over 80 per cent of the Expo built environment is planned to be retained for District 2020, and eventually expand into a city covering more than four million square meters. District 2020 companies will be focused on technology and innovation, including a mix of corporations and SMEs. The DEC is also expected to be a key facility in the site.